"I have plenty of clever generals but just give me a lucky one". 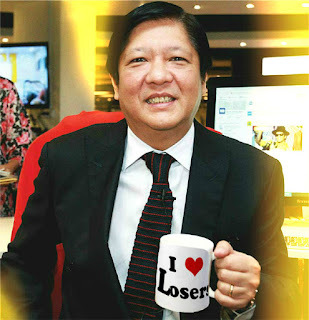 1) Is Bongbong Marcos a "lucky general"? Lucky Generals is named after the Napoleonic quote - "I have plenty of clever generals but just give me a lucky one". Napoleon observed that one of the key attributes in judging a general was whether the man possessed a lucky streak. He felt that some people seemed to get better breaks than others no matter what their capabilities. In 1995, Marcos ran for the Senate under the NPC-led coalition, but placed only 16th. He made a second attempt for the Senate in 2010, this time securing a Senate seat by placing seventh overall. (In contrast, his father, Ferdinand Marcos was the topnotcher in the 1959 Senatorial elections). 2) The Best Woman Won! Remember the 30, 000 Victims of Martial Law! 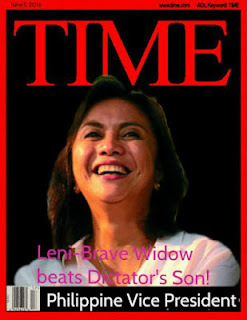 "Ver, Marcos and the rest of the official family plunged the country into two decades of lies, torture, and plunder." Criticisms have been leveled at Marcos for being unapologetic for human rights violations and ill-gotten wealth during his father's administration. "In response to Ferdinand “Bongbong” Romualdez Marcos, Jr.’s call that teachers and students of history should make a judgment about the Marcos administration, we, the undersigned members of the Ateneo de Manila community, vehemently oppose and condemn the ongoing willful distortion of our history. 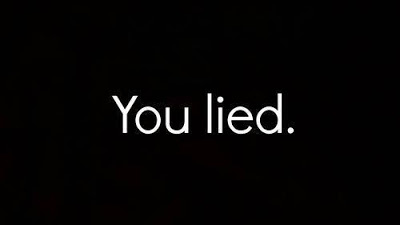 We deplore the shameless refusal to acknowledge the crimes of the Martial Law regime. We reject the revision of history, disturbing vision of the future, and shallow call for “unity” being presented by Marcos Jr. and like-minded candidates in the 2016 elections. 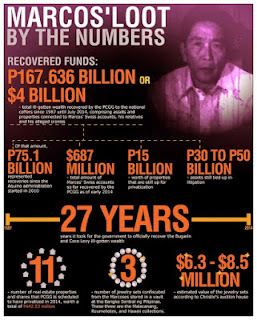 "The Marcos regime’s economics of debt-driven growth was disastrous for the Philippines. The regime was not interested in inclusive development, long-term state-building, nor genuine social transformation of the country, despite its “New Society” rhetoric. Instead, Marcos was mainly concerned with perpetuating his personal hold on power by favoring family members, friends, and other cronies. Thus, Marcos simply created new elites or “oligarchs” rather than abolish them -- supposedly one of his main justifications for declaring martial law. 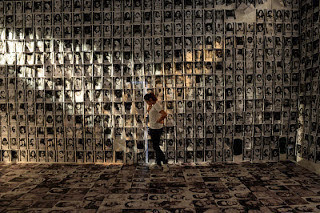 Those who dared challenge the regime’s monopoly on power, whether politicians, business people, political activists, organized labor, peasants or urban poor, Church workers, students -- young or old, rich or poor -- were intimidated, imprisoned, kidnapped, tortured or summarily executed. “The Trustees of the Catholic Educational Association of the Philippines, representing the 1,425 CEAP member-schools, colleges, and universities, support the faculty of the Ateneo de Manila University in their call against the attempt of Ferdinand Marcos Jr to canonize the harrowing horrors of martial rule. On March 28, 2016, the Department of History of the University of the Philippines released a statement entitled "MALAKAS AT MAGANDA: Marcos Reign, Myth-Making and Deception in History". "Great danger now lurks behind a deceptive nostalgia for a past that never really existed--that the Marcos years were a period of peace and prosperity. 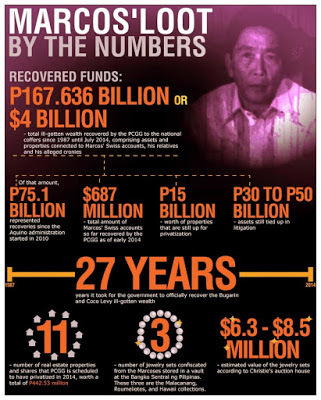 This is patently Marcos myth and deception. Under martial law, the country was plunged into a climate of repression and plunder and then into a social crisis that exploded in the 1980s. To say then that EDSA interrupted our becoming like Singapore is a big joke, a malicious lie. 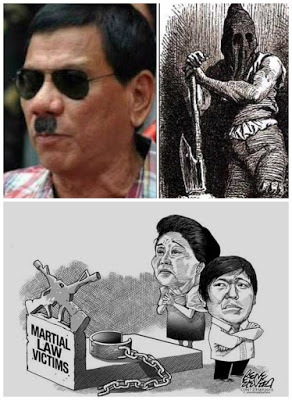 4) DUTERTE/MARCOS :The WORST Possible Combination for the Philippines! Presidential bet Rodrigo Duterte said if he is elected president and fails to stop criminality in three months, he will resign and give the presidency to Sen. Ferdinand Marcos Jr.
“If elected president, give me about three to six months I will get rid of corruption, drugs and criminality,” Duterte said. However, he admitted that he needs everyone’s cooperation in order to achieve this goal. “They say my timeline is ambitious, you know if I am already president, in the third month I am sitting there as president and I fail because nobody believes me, I really cannot do it even if you give me 10 years of rule. “Eh mabuti magsibat na lang kayo, or ako. Kung hindi ko magawa 'yan sa tatlong buwan e 'di ibigay ko na lang kay Bongbong (If I fail in three months, better leave the country or I will step down and give the presidency to Bongbong),” Duterte said. 5) BongBong Marcos: YOU lied! 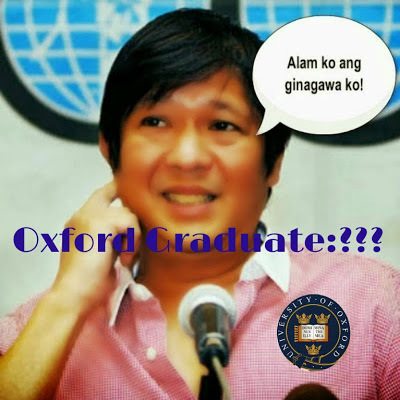 Asked by a reporter whether he earned a bachelor’s degree or a diploma from Oxford, Marcos replied, “I got a diploma. 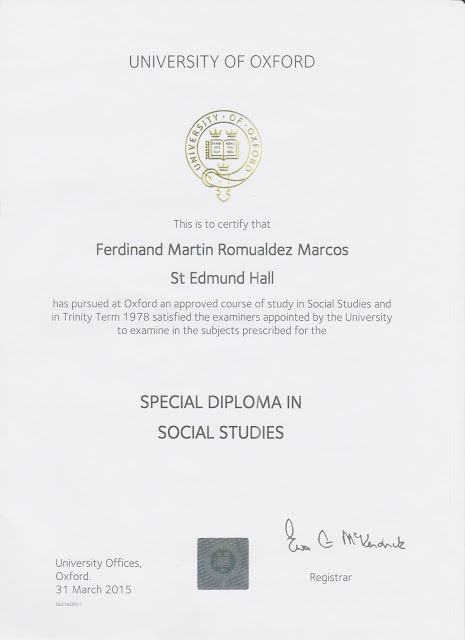 "We can confirm that a Ferdinand Marcos matriculated at the University of Oxford in 1975 to read for a BA in Philosophy, Philosophy and Economics. 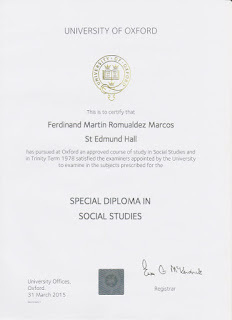 According to our records, he did not complete his degree, but was awarded a special diploma in Social Studies in 1978."